From classic hotels and resorts to historic inns, there’s a Southern property that’s sure to bring joy to your group’s yuletide experience. Here are nine favorites that give Christmastime an extra twinkle. 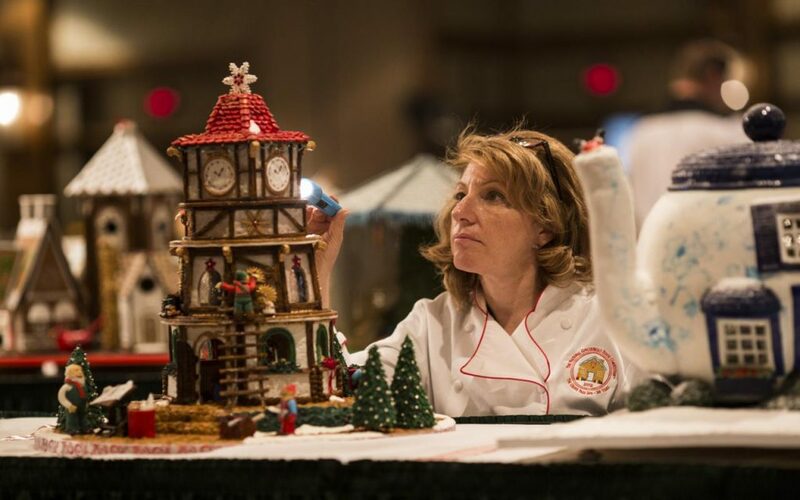 2017 will mark the 25th annual National Gingerbread House Competition at the Omni Grove Park Inn. The event takes place from the Sunday following Thanksgiving through the first week of January. Contestants from around the country will display their sugar-and-spice culinary masterpieces throughout the resort. This celebrated event brings a national panel of judges from food, art and media. Hundreds of edible works of art will be on display in a setting of themed trees, festive lights and holiday decorations. Gaylord Opryland’s Country Christmas is a wonderful combination of extravagant holiday decorations and events all designed to put you in the spirit of the season. Begin-ning the second Saturday in November and continuing to New Year’s Day, the holidays are in full swing. The 2016 lineup included Dr. Seuss’s holiday classic How the Grinch Stole Christmas! The Musical. The Grammy Award-winning Larry Gatlin & The Gatlin Brothers is being featured at the Christmas Dinner Show. There’s a full calendar of events and activities to fill your days and nights with memories. The annual Lobby Lighting Ceremony has been an 80-year tradition. Held the Tuesday after Thanksgiving since the 1930s, the Waldorf Wonderland Lobby twinkles with thousands of lights on 44 birch trees and scores of Christmas trees decorated for the season. Enjoy the popular Teddy Bear Tea and witness Santa’s journey through the New Orleans rooftops. Regardless of when you visit during the holidays, you’ll enjoy the spirit of the season and elegant holiday dining. Just when you thought it couldn’t get any better, 2016 has brought a complete transformation of Christmas at the Galt House. The seventh magical year introduced a new attraction, KaLightoscope: 12 Days of Christmas. Each of the 12 days is featured with larger-than-life silk luminaries handcrafted by Chinese artists. Longtime favorites of Galt House guests are Winter WonderLane, A Very Merry Magic Show and Dancing Bellmen. If ever there was a grandparent/grandchild tour, Christmas at the Galt House might just be perfect. The smallest property on our list, this bed & breakfast with 16 richly furnished suites is a delightful headquarters for a visit to Savannah at Christmastime. Decorated for the holidays, the boutique hotel provides a complimentary Southern breakfast. Conveniently set in the historic district on Oglethorpe Square, it is just steps away from the Savannah Harbor Festival of Lights and the Savannah City Market and River Street. The spirit of the holiday season twinkles in Savannah. 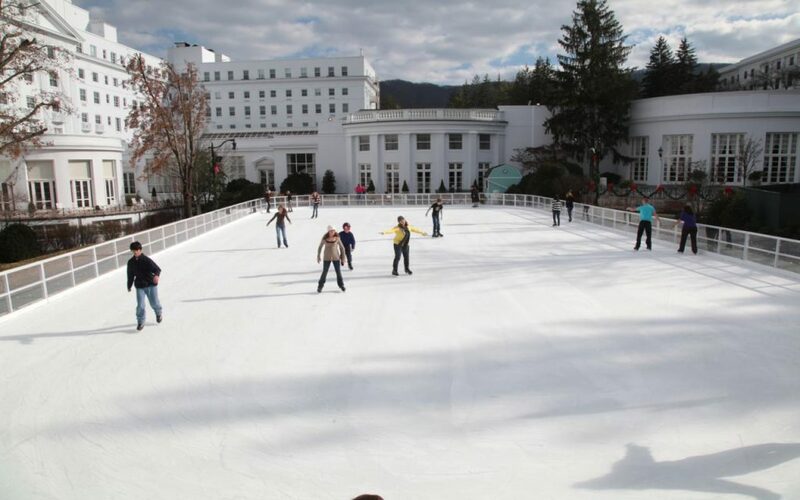 From mid-November through mid-January, The Greenbrier celebrates 60 Days of Holiday Cheer. There’s something magical happening every day. Did you miss the tree lighting in your hometown?No problem—The Greenbrier has weekly tree lightings. Explore all the remarkable holiday lights on a trolley tour, commemorate the holiday season with a carriage ride or practice your best routine on the ice skating rink. Indoors a special holiday spa treatment is available to guests, while regular special events range from book signings and trunk shows to meet & greets and tastings. Festivities during the holiday season are a century-old tradition at the grand, historic Arlington Hotel. Exciting events, receptions and entertainment begin with a Thanksgiving Day feast and continue through the gala New Year’s Eve celebration. Annually the weekend following Thanksgiving a different theater company brings laughter to the Arlington with their presentation of the popular The Best Christmas Pageant Ever. The Gingerbread House Celebration in early December is held in conjunction with the annual tree lighting and complete with carolers. An annual performance in mid-December by the Hot Springs Flute Ensemble dates back more than 90 years. The Arlington’s full-service spa with the Thermal Bath House and its hot spring water is a favorite of guests. You would expect the Holy City to display yuletide joy with a heavy dose of Southern charm. Nothing is more Charleston than the historic, 21-room Wentworth Mansion. Each year the downtown inn adds a classic seasonal touch with evergreens and an illuminated Christmas tree. The popular Dickens Dinner at Circa 1886, the property’s restaurant, may be the highlight of your Charleston visit. A local historian and period actor shares the popular A Christmas Carol while guests are treated to a four-course dinner inspired by the Dickens classic. Now in its 30th year, Holidays at The Jefferson Hotel combines lavish decorations and delightful holiday music. The season tradition-ally kicks off with the annual Tree Lighting the Monday after Thanks-giving. Open to the public, the event features hot chocolate, cider, cookies and Christmas carols to set the mood. 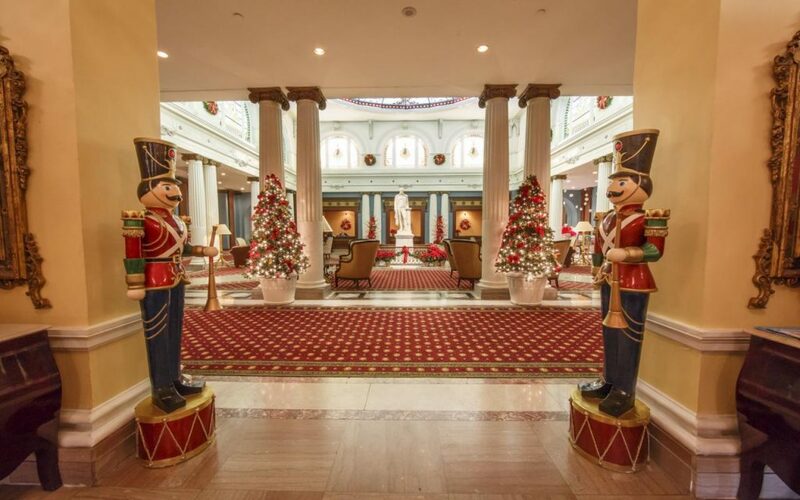 Through New Year’s Day, poinsettias, ribbons and garland, and dozens of toy soldiers adorn the hotel’s public areas. Local musical groups treat guests of The Jefferson to holiday sounds throughout the season. Performances (at noon on most weekdays) include orchestras, ensembles and choirs. Each property offers special holiday packages for groups, families and couples. Most can include breakfast and a memorable yuletide meal. Regardless of where your Southern holiday trip might take you, embrace the season with joy and happiness.